So late in December, just around Christmas time, a relative of mine contacted me to tell me that she had my great grandmother's wedding dress and asked if I wanted to have it, given my love of vintage. Of course, I said YES! Well, today, a very special parcel, containing the two piece wedding dress of my beloved grandmother Adeline's mother, arrived!!! Of course, it is sooo petite that I could not really get it fully on the mannequin to display it in its full glory, and I didn't dare attempt to try it on myself, but here are some photos I took of the most amazing vintage item in my collection EVER. It was so so well made (inside and out) and it is in incredible condition. Below is also a photo of my great grandmother actually wearing the outfit. My family member and I were talking and we think the wedding took place around 1900-1901 or so. What do you think, fashion historians? Does the style of the dress seem to correlate with this time period? 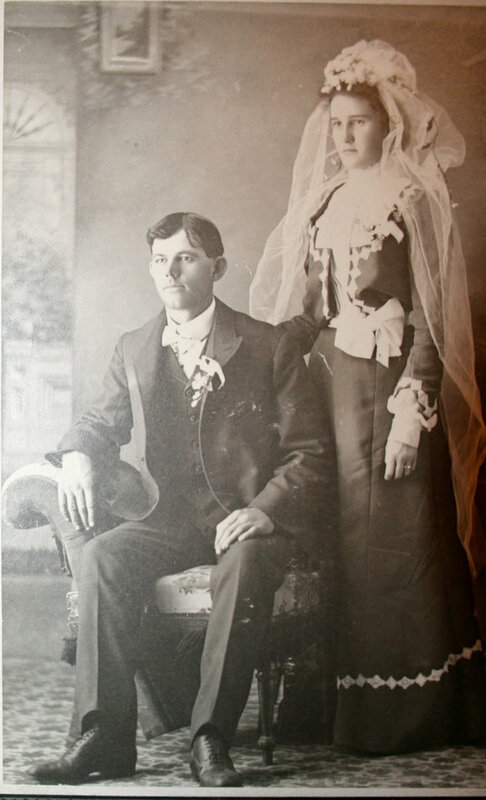 I should note that my great grandparents came from hardworking immigrant families of Dutch extraction, who settled for a time in the American Midwest and then moved North to the Canadian Prairies, so I love that this photo reflects a more modest approach to wedding fashions. I think the fact this is not a white wedding dress (as Queen Victoria had made fashionable earlier in the Victorian era), not ostentatious (i.e. no giant pigeon chest or giant leg o' mutton sleeves) and not made of excessively expensive and fancy fabrics all seem to reinforce the idea that this set was likely made to be beautiful but practical and possibly even usable for other occasions. Really, without the veil, waist bow, etc, I think it looks a lot like an afternoon ensemble from the era. Even the color choice seems practical, as it would hide dust and dirt more effectively than white. The current absence of the appliques on the skirt that were there in the picture on the wedding day makes me think this skirt (and perhaps the full ensemble) was worn by my great grandmother after the wedding day. So neat!! absolutely stunning, both on and off your GGmother. I like to think someone saved this just for you, fate had a hand in it. It's an amazing piece of family history and I am incredibly envious to say the least. Wow! What an amazing thing for you to have! I mean, it would be lovely to have your ancestor's wedding dress even if it were hideous, but the sheer gorgeousness of that suit makes it all the more fabulous an aquisition. I think blue wedding dresses are lovely. I love the picture of the inside too - fascinating to see how the boning(?) strips are sewn in. That is so lovely for you to have a family heirloom. Wow! What a tremendous find! How nice of your relative to think of you! A for it being petite, people back then seemed tinier, didn't they? Shorter, and thinner. Of course, they didn't have today's fast foods, lol. They were practical to have wedding dresses that could be worn again, too. One of my very favorite writers, Laura Ingalls Wilder, when she married Almanzo Wilder, had her mother make her a black dress since they did not have time to make a whole fancy trousseau and she wanted to make sure she had one good 'married woman' dress. THAT IS SO AMAZING!!!!!! not only is it so so gorgeous but the pristine condition!!! and the color is so deep still! amazing!! when i see victorian and edwardian jackets at antique and vintage shops they are always faded or falling apart, none even approach the condition of yours! so beautiful! thanks for showing it!! OOOOOOOOOOO! now you can also have a Baroness Museum, this dress has musem quality! it's stunning. Happy for you that you got it. Wow, what an amazing, amazing gift! And how wonderful to have a piece of your history in clothing form! Oh my, Jill, you are so lucky to have such a beautiful piece of your family history! I don't know a lot about the period but I would agree that it looks similar to afternoon tea outfits I've seen. =] Lovely! What a wonderful piece of family history! And what a beautiful choice for a wedding gown; your grandmother looked lovely in it. Totally gorgeous outfit! I wish I could find such fabulous outfits. Wow! That is so amazing and absolutely beautiful! The color is still so vibrant! YAY! What a treasure! thank you! I agree with Miss M. Somehow I feel that this was meant to be mine. I cannot describe the feeling I got when I opened the parcel. I felt the presence of both my grandmother and great grandmother (whom I never met unfortunately, as she died in her 40s from the ravages of TB, I believe) all around me. Very emotional!! As honey hi notes, it's also in unbelievable condition. Not a single moth nip anywhere, very minimal foxing. Just incredible. I have to find out whether my great grandmother made it herself or not. I have a feeling she did. My grandmother was a self-taught seamstress and I think she *must* have been taught a lot by her mother. The amazing skill apparent in the inside stitches is baffling. A real treasure indeed!! I don't think I should have called it a dark navy. As Debi and others have pointed out, it's a richer brighter blue. Cobalt? I'm not sure of the exact fabric, but wow has it withstood the tests of time!! Your dating is right on the mark. I have some fashion mags from 1901, and I recognize the sleeve style in particular as a dead ringer for those years. You are truely BLESSED to have your hands on this beautiful piece of not only your family history but also fashion. Wow!!!! What a wonderful heirloom!! I am sure you treasure it dearly. And I must say how beautiful the outfit is and your Great-Grandmother too!! Absolutely amazing and I enjoyed hearing the history behind it. I CANNOT get over the condition and am so glad it is now in your capable hands to continue preserving it. Oh my goodness--how neat that you were able to get hold of such a beautiful family heirloom. The outfit is just breathtaking. I have a soft spot for clothes from this era, and it's always neat to see both the outside and inside of a garment. Wow. What an incredible thing of beauty this is. So wonderful that you can see it and own it and love it. Oh my, how unbelievably amazing! You must be so incredibly excited! This is so amazing and exciting! I'm so happy for you that this treasure in now in your possession now---I would give anything for one of my great-grandmother's dresses. I came across your blog and just had to comment on this fabulous post. You should try the two-week free membership on Ancestry.com to locate your great-grandparents wedding certificate to date this lovely dress. Be careful though, I got hooked on genealogy this way, lol. I have located wedding certificates for my great and great-great grandparents. I only wish I had a dress or photo to go along with them. This find is truly a treasure! Wow, what a manificent piece. You are so lucky to have this treasure. It looks like it is in such beautiful condition for a dress from that era. I wish that I had any clothing from my grandmother, let alone my great grandmother. Thanks for sharing pictures of this treasure!